GIANCARLO VITALI . Bellano (Lecco), 29 november 1929 - 25 july 2018. He was born on the 29th of November 1929 in Bellano on the Lake Como. He began painting when he was fifteen, after having worked for the Institute of graphic arts (Bergamo). In 1983, Giovanni Testori wanted to meet the artist, after having seen a printed painting. A profound and solid relationship, founded on mutual esteem and admiration, stems from this encounter. The year after Testori dedicated to the artist an article in the third page of Corriere della Sera and afterwards organized the first solo exhibition of the artist. Thus from that moment on he got to perform in several public and private locations and released a copius series of catalogues and engravings portfolios. Each of Vitali’s painting expresses astonishment. Vitali lives in a period of his own. Ideal companions would be Goya and Velàzquez, Rembrandt and lots of 17th century Lombard painting. He is a man of the people like the Romanino of Pisogne, Lotto of Trescorre. Vitali’s universality resides in his knowledge of being a native; the antibodies matured in his own land allow him moral disenchantment with respect to the contradictions peculiar to con- temporary man, in the existential dismay that we are experiencing at the dawn of this new century. Such a belief says that everything, but just everything, is "portrait" in Vitali, or in the area of Bellano. Much more correct phrase than the one saying how everything becomes "portrait" in him. If anything, Vitali’s irony, in his own way, means to absolve all of us. And it means to absolve us through the only charity falling within the painter’s competence: that one of the pictorial splendour of the matter. Characters and situations of the soul, passing towards unknown places, surprised by the blinding light of art. Not the fluorescent light of neon tubes in video games, but that one that “candies men and objects in an eternity of instants”, quoting Montale. Only painting manages to fix the most intense moments, a subdued or shouted representation which possesses the interior strength of the poetry in a glance which grasps reality to then bring it back onto the canvas without letting the fragrance of the moment escape. 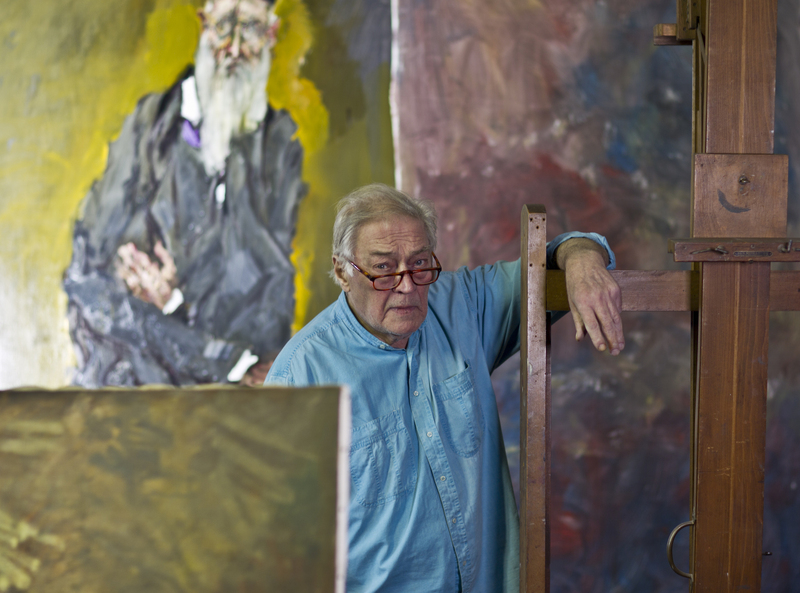 Vitali courts the matter and dives in it euphorically, with exaltation, rapture even in the most macabre subjects, revitalising the models of Chaine Soutine and Willy Varlin. It cannot be denied that Vitali is a painter of painting (…) He does come from what has been painted by others, particularly from the painters of Lombard realism, and yet his work i salso instinctive, natural painting, “a first”, truly without comparison or confines or unions.